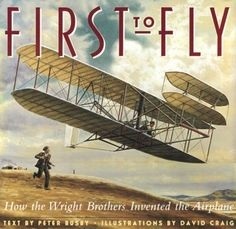 Today at 10:35 AM (1903) marked the first heavier than air flight of the Wright Brothers' Flyer. Imagine what they would think of aircraft today. The Wright Flyer had a wingspan of 40' 4". The first flight was a distance (120') of less than the wingspan of a Boeing 747. It made 4 flights before being damaged beyond repair by the wind. Imagine those who laughed at such a contraption and the "idiots", a couple of enthusiastic dreamers with a world-changing idea. Don't you just love getting the last laugh? Every time you board a flight be thankful for the child-like belief ability of grown men. My brother and I (the "Wrong Brothers"), wanted to fly so badly when we were towheads in Decatur, AL. that we had to make it happen. With little more than a bold and vivid imagination more exciting than boredom, we did it. Our "flight" from the top of a building to the sand pile was about 8 feet! Giles reminded me a few years ago that he depended on me to drive him to the airport in Jasper, AL to enter his dream world for real before he had a driver's license. He did get "his wings", joined the army and became a successful helicopter pilot. With his training, he eventually became a "level-headed" commander of two "completed" home-built aircraft. I waited until a few years later to become bold enough to earn my wings as a private pilot. Napoleon Hill, the dreamer of writing the first book on the science of success and achievement finally did it. Upon being pressured by the publisher of his work to choose a title, he was so embarrassed by the silly suggested title he quickly decided to entitle it, Think and Grow RichAnother mission accomplished! This is the book, Earl Nightingale had spent 17 years looking for (1951) that inspired the first gold record award, a million records for self-help talk-type production, "The Strangest Secret", ("We become what we think about"). Napoleon Hill was the author of the famous statement. "Whatever the mind can conceive and believe, it can achieve". Symbolic of evil is turning a magnificent flying machine into a bomb. Don't you just hate evil! What a big, full, beautiful world we live in! Let's make the most of our adventure during our "holiday on earth" (EN). Thanks to the bold dreamers who've always been the punching bags of ridicule in the beginning but cheered on when they succeeded and honored beyond their time!